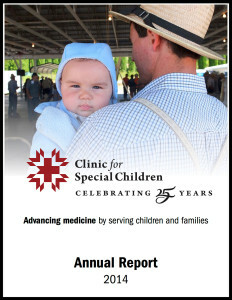 This is the first time the clinic has offered a publicly accessible annual report. We want to share our successes, challenges, and opportunities, while making our finances and needs transparent. We recognize trust is the bedrock of the clinic’s future – Trust between patients and staff, trust between supporters and the institution, and trust between those who need care and those willing and able to offer it. This report, and ones to follow, is intended to cultivate that trust. We look forward to a bright 2015 as we strive to continue to lead the effort to apply advances in medical knowledge into strategies that promote the health of children, families, and communities.